If the advice below is not followed then any warranties on our flooring will be invalid. Please see our terms and conditions and Storage, Fitting and Maintenance Instructions. All sales are based on our standard Terms and Conditions. You should also confirm that you have read the Product Specification Data Sheet and the Storage Fitting and Maintenance Instructions. These can be found in the product details on the web site. This article has been produced after extensive research and more importantly our own experience in fitting wooden flooring over underfloor heating (UFH). All of our engineered wooden flooring is suitable for any type of UFH. There is a very interesting article from Brain Sensecall at the end of this publication that gives an independent view of wooden flooring with UFH. As carpets are an insulating material they are not as effective with UFH. The following are the basic steps when you are considering choosing UFH with a wooden floor. Wooden flooring is the best material and choice for UFH as it is natural, warm to the touch (not like stone) and environmentally friendly as it is a renewable source that helps the environment and reduces global warming. You should get a certificate from the company that fitted the UFH system to ensure that it is fully operational with controlled temperatures so that the surface temperature does not exceed 27 degrees centigrade. The only way to control the surface temperature of the screed is with flow control vales and not thermostats. If no certification is available from the installer. Before the floor is fitted the under floor heating system should be calibrated back to the boiler to ensure the surface temperatures of the sub floor is correct. If there is no certification it may well invalidate any guarantees that apply to the wooden flooring and you should look at UFH problems. Your choice of a UFH system will depend on your current sub floors, height restrictions and what you want the system to do for you. 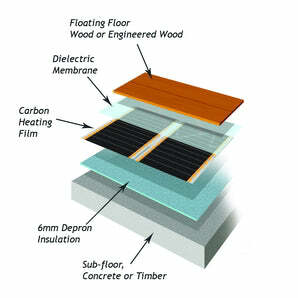 A good source of information can be found on this web site http://www.uhma.org.uk/ Electric carbon film and mat systems are acceptable for background heat and many are now getting more effective but hot water system are generally more efficient and when you glue a wooden floor directly to the heated screed you get the best floor with the warmest touch. There are a large number of systems available but we always advise our clients to choose carefully and ensure that whoever fits the system is qualified and follows the manufactures requirements and advice. A lot of hot water systems do not control the boiler temperature properly which can lead to hot spots and other issue affecting whatever you lay on the floor. A typical boiler will heat water to about 82 degrees which is much too hot for pipes in an underfloor heating system. Any system you install must have the pipe temperature controlled by valves and not thermostats. In the John Guest and Nu Heat system the hot water pumped from the boiler goes to a pump rack, where it is mixed to approximately 50 degrees centigrade and is then distributed via a manifold to the heating circuits. The surface temperature of the screed for wood flooring must never exceed 27 degrees centigrade. You should always choose an engineered floor dried down to at least 8% moisture content. Engineered Wooden Floors from the Solid Wood Flooring Company are a perfect match with UFH and the choice will be purely based on personal taste and what matches your budget and decor. We have over 90 different wood floors in our top quality engineered flooring range so please choose some samples from our wood floor product guide and we will post them to you first class, free of charge so that you can decide on the most suitable colour and finish for your project. There's been much discussion amongst flooring contractors in recent months about the thorny subject of anhydrite screeds. Many installations are failing, seemingly because of the highly specific requirements needed to ensure success. So much so, that the Contract Flooring Association has published a technical paper on the generic installation of floor coverings onto these calcium sulfate-based screeds, see more information here: http://www.schluter.co.uk/tiling-on-anhydrite-screeds.aspx Anhydrite screeds are a mixture of screeding sand and binder and are more porous than concrete screeds; these should NOT therefore be sealed with a DPM before installing wood flooring because as Anhydrite screeds are gypsum based any moisture kept in the screed will break down its structure. We always prefer clients to have a concrete screed which ideally should be between 60mm and 70mm which allows a more consistent heat dissipation. General cement and Anhydrite screeds dry out at the rate of 1mm per day. If you have any sand and cement type screed you should always seal the surface with a damp proof membrane (DPM). It protects the screed against moisture penetration from the surface, and prevents any potential long-term problems. Evenness – maximum tolerance of 3mm per linear metre where the maximum deviation in flatness in any direction is 3mm under a 3 metre straight edge. Any plywood or Chipboard subfloor must be high quality and also sealed. This should be left to qualified installers recommended by the manufacturer of the UFH system and you must have “flow” control valves to ensure that the temperature never exceeds 27 degrees where the wood floor meets the screed or underlay. You cannot achieve this with thermostats. The best system is to have sensors fitted into the screed that will turn the system off if the surface temperature exceeds 27 degrees. Ensure that you meet all building regulations and terms and condition of the UFH system manufacturer, do not take short cuts to save money as the longer term costs could be enormous. NEVER dry the screed out by using the underfloor heating system you will destroy the integrity of the cement screed. Commissioning an UFH system before installing a wooden floor. You must never install a wooden floor before commissioning the system as set out below. To gain the best performance from your heating system and the finished floor it is important to have all components working together. Hot water radiant underfloor heating system must be installed in conjunction with the manufacturer’s guidelines and commissioned and run for 21 days to ensure that the system is fully operational. The screed must have a moisture content less than 1.8% before the underfloor heating system is started up. If the screed is 75mm then in normal weather conditions this will take at least 75 days to cure and dry out. Set the water temperature in the pipes to 20 degrees Celsius on the first day, and then gradually increase by a maximum of 5 degrees Celsius every 24 hours, up to a max. 45 degrees Celsius. This maximum temperature must then be maintained for approx. 8 days. This is controlled by flow valves and not thermostats. Then reduce the water temperature in the pipes in the reverse order over 8 days. The total procedure to take 21 days. During this procedure ensure that there is good ventilation in the room so that any moisture that is there will be released and can be correctly discharged. After commissioning, the installer should provide documentary evidence of commissioning; particularly the temperatures achieved at the finished sub floor, and these should be available to the trades that follow. This documentation should fully explain how the surface temperature of the screed is controlled by the flow valves. CRITICAL: The surface temperature must never exceed 27 degrees centigrade. Unless a condensing boiler with a low temperature control is being installed then a mixing valve is used to reduce the temperature of a normal boiler which is 82 degrees down to about 50 degrees which will give a surface temperature on the screed of about 25 agrees depending on the pipe spacing. This is the safe way to control the system. In more advanced controllers, called weather compensators, use an external sensor and programmer to adjust flow and temperature to compensate for outside conditions. It is vital to have a device to control the boiler and pump to prevent flow temperatures exceeding safety limits. There are new sensors that are part of the subfloor and will turn the system off if it gets to 27 degrees at the surface. The UFH system must have been commissioned and turned on. Leaving the boards in their cartons with the ends open. There must be some battens under the bottom layer of cartons so that air can circulate.. The room temperature must be at least 18 degrees C.
The floor surface temperature must be a minimum of 15 degrees C.
The air relative humidity must be between 40% and 65%. CRITICAL: The surface temperature of the screed must never exceed 27 degrees C.
Concrete and Anhydrite Screeds: Glue down using SW890 MS Polymer Adhesive and leave to dry for 48 hours after fitting before turning on the heating system. Floating Floors for other surface finishes: you should always glue a floor if possible as you will not get such effective heat transfer if you float a wood floor. Make sure that you have a recommended underlay or where you have electric heating that the appropriate barrier between the carbon heating wires is installed and then lay the boards by gluing the tongue and grooves together with a high quality wood adhesive. 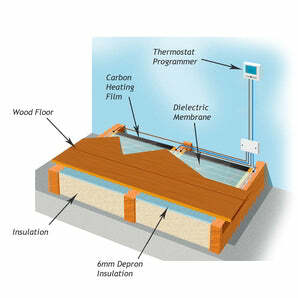 We recommend and supply the Timbermate Heat Flow Underlay. Secret Nailing or Secret Screwing to Joists: Ensure that there are no air gaps between the surface of the boards and heating system as air is an insulator and you will not get effective heat transference with potential hot spots. THE BOARDS MUST NEVER DIRECTLY TOUCH ANY HOT WATER PIPE. Wood flooring will have some moisture in its cell structure and natural oils help to maintain this. if the floor is overheated and allowed to dry too much then the fibrous nature of the cell structure will start to split. Water based finishes should be applied professionally so as not to create problems when the heating system is turned back on. Once the floor is fitted the system should not be turned back on for at leads 48 hours, and if the floors have been oiled it is important to follow the manufacturer’s curing time before turning the system back on. It is important not to dry the oils out by turning the system back on. For Natural oils this could mean not turning the system back on for 14 days. Also after the oils have cured you should turn the system back on and increase the temperature by 1 to 2 degrees a day using the flow controls and keeping the thermostats very low. Wood flooring is a living thing on oiled floors always keep them maintained. Generally the temperatures should not vary drastically and in a perfect world the UFH should never be turned off just kept at a very low temperature. Always try to avoid taking the floor from one extreme of heat and humidity to another within a very short timescale. Ideally the room temperature should be 20 degrees Celsius and not lower than 18 degrees Celsius. The air relative humidity should be between 35% & 60%. If you do turn off the system and the floor gets cold as it can in Summer then you must turn the system back on in a controlled fashion as you would when commissioning the system after installing the wood floor. If you turn it back on to full heat this will “shock” the wood flooring and could cause lifting or the top layer of engineered boards de-laminating. You must also use the recommended maintenance kit to clean and look after your floor. We live in hard times – at least when it comes to flooring. In many UK homes carpets have been confined to the bedrooms while the public indulges its current tastes for hard floor finishes – stones, ceramic, slate and, the current favourite, wood. Sales of polished timber floors have risen sharply – matching the booming demand for underfloor heating systems. But are they a match? There are those with insufficient experience of underfloor heating and/or timber who question the relationship. Their minds can and should be put at rest. However, since success and failure often march close together, it’s worth restating a few of the fundamentals to make that “success” is the certain outcome. Many types of wood flooring are suitable for use with underfloor heating (and cooling) - but not all. If in doubt, the first step is to consult a Specialist Supplier, the Timber Research and Development Association (TRADA), British Standard 8201:2011, or all three, as to the characteristics of the type in question. The most essential prerequisite before heating a wood floor is moisture control. Being a natural organic material, wood has a density in the region of only 500-700 kg/m3, which is about 33% of concrete. Newly felled timber is made up of long cellulose strands bonded by lignin with “veins” and “arteries”. Sap and water vapour content accounts for more than 50% of the log’s mass. Mature ‘seasoned’ timbers from the specialist suppliers have controlled moisture contents ranging from 28% saturation - below which point shrinkage effects become noticeable - to 6% when ‘bone dry’ where shrinkage ceases to be a factor. The Laws of Thermodynamics inextricably link moisture content, vapour pressure and temperature, so when wood is used to conduct heat, best practise requires that the floor top surface temperature should not exceed 27oC (75W/m2). A practical guide to moisture content can be found in BS;8201:2011. Virtually all shrinkage takes place across the grain (not along the length) where 1% moisture content change or +/- 5% Relative Humidity = approximately 2mm per metre movement of timber. However, this should not to be confused with thermal linear expansion of timber which is about half that of concrete. Importantly, if boards are initially laid at say 9-10%, then during operation the moisture content can be expected to fall to 6-8% with an attendant shrinkage. Clearly, not all wooden floors are heated continuously, but in all cases a suitable gap to permit thermal and humidity driven expansion and contraction effects must exist around all room perimeters, internal corners, floor ducts, posts, manholes, and neighbouring floors. The amount of expansion gap is never less than 8mm, and often13mm -15mm (if in doubt consult a timber expert)." The thermal resistance measurements regarding underfloor heating systems with a screed when using engineered wood flooring are below. The MS Polymer adhesive we use to glue the boards to the screed dries like a hard rubber and ensures good heat transmission this is manufactured for us by Sika and is referred to as SW 890. We have never had any problems with our 20mm thick boards with underfloor heating systems especially those that have a 70mm thick screed hot water system with a control flow valve that restricts the temperature of the water out of the boiler into the heating pipes to a maximum of 55 degrees and pipe centres of 200mm. It’s essential that the on-site team consider how a suitable environment for kiln-dried timber is to be created during installation in any newly constructed or refurbished building. It will be necessary to pre-condition the room by pre-heating the floor very carefully by raising the temperature of the embedded pipes, or cables. 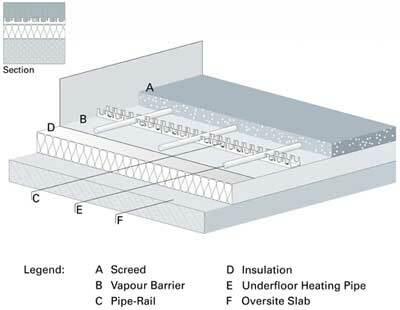 Modern timber floors - must meet Building Regulations Part L: 2006, and Part E which requires a layer of not less than 100mm thick mineral wool insulation to be laid between joists as an acoustic barrier. This also acts as additional thermal insulation, enabling the floor heating system to operate even more efficiently. Whenever wood floor/electric UFH is involved, attention should also be paid to the Electrical Regulations BS 7671: 2001 (see Para 5.2) where cable temperature limitations require cables to be oversized to cope with unusual temperatures. Designers should, therefore, make sure that the heat loss of the structure is less than 75 W/m2 to ensure the timber floor can operate at or below the maximum permitted 50oC contact temperature for timber and wood products. Finally, installing a remote thermostatic sensor device below timber floors will limit temperature and associated humidity, thus safeguarding the client’s interests. We have extensively researched the market and this article is to help you when considering the installation of underfloor heating (UFH). Wooden flooring is the best material to install on top of any system due to it warm feel and thermal properties With a wooden floor in the perfect world the UFH system should always be left on even at a low temperature. Wood is a living material even after it is cut down, kiln dried and processed. The cellular structure will always react to its local environment and if you are kind to your floor it will be kind to you. Remember paper is made from wood and when it gets wet it is soggy and yet you can dry it our again but it never has the same characteristics. If you turn off the UFH system then the boards will become cold and if left for some time in winter or summer when the air is humid the wooden floor will pick up moisture. When the heating is then turned back on the environment the wood is in will change dramatically, and it can cause stress within the board, just like when we go into a hot tub in freezing weather. We cannot guarantee any of our flooring if you do this. You must clean the wooden floor with the appropriate maintenance kits and in accordance with the manufacturer’s instructions. For our flooring always use the recommended maintenance kit if you do not then all our warranties and guarantees are invalid. The majority of modern UFH systems are warm water systems, which integrate high tech plastic pipes either within or just below the floor. The heat generated by radiators is transferred from a small surface area far hotter than the space it is heating. By comparison, UFH transfers heat from a very large surface area, which is only slightly warmer than the room. In concrete floors, it is usual to set out the heating pipe or cable on top of insulation before the screed covers the pipe and completes the floor construction. Table 2 Tiles/Hardwood The table on the next page shows the surface temperature of the screed according to the water temperature in the pipes.